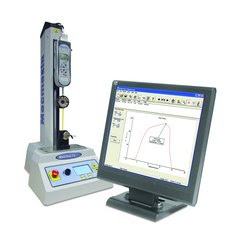 Emperor Lite that is the new data acquisition software package from Mecmesin, gives the users opportunity to evaluate and transform force and torque test data from simple numbers into meaningful graphs and results. How does it work? According to the PRWEB, plotting data 'live' directly onto a PC screen, the software operates with a simple graphical interface providing instant access to a variety of popular diagnostic tools, such as common calculations: peak, trough, average, area and many more, whilst colour-coded results allow easy identification of pass/fail scenarios. As for the multiple traces, they can be overlaid for comparative analysis and are fully customisable. Test data can be exported to other software packages, such as Microsoft Excel for further analysis or printed as a report combining graph and test information for a quick record. John Page, Managing Director at Mecmesin comments, "Emperor Lite offers customers an ideal solution to take their test measurements to the next level of evaluation. Plotting both force/torque vs time and force/torque vs displacement curves, this software enables manufacturers and quality control personnel to make thorough evaluations in determining the properties of their products." Emperor Lite is available directly from Mecmesin or through their worldwide distributor network.